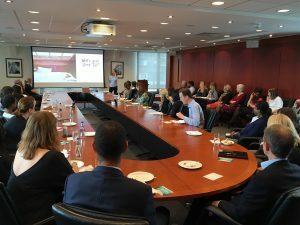 Now in the second year of our annual workplace wellbeing programme with asset management firm, Lazard & Co, we worked closely with the HR team to deliver an annual prgramme of monthly wellbeing lunch and learn sessions. Lazard & Co have booked workshops on stress, resilience, sleep school, nutrition, working parents and many more. Lazard also enjoy two yoga classes with us each week.